The harness above has a belt and 4 straps. Two of the straps are split with long tails that wrap around the scabbard; what are these straps called? The other 2 straps are hanging from the sword belt; what are these straps called? What are the names of each of the various straps and parts on the above harness? Do the various split sections of the strap in the above harness have names? I am sure that the craftsman of the Medieval period had names for all of these parts. Is there a good detailed reference for this specific information? Referring to the article, besides locket, I have heard that area of the scabbard also called the throat. Is that wrong? All scabbards have throats. It's what you first stick the sword into. Not all have lockets, which are metal bits sometimes found at the throat. That's my take, at least. In the study of scabbards of the early medieval (ie pre-1066) and earlier periods, the term usually used is 'mouth-band', in English at least. At the throat you have either a locket, if it is terminated, or an integral rainguard. You can have a terminated throat without the locket. At the tip of the scabbard, you would put a chape (or, chappe) to protect the tip. 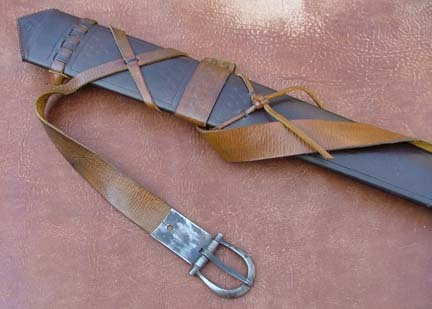 A scabbard's belt, I call "The Suspension" and suspensions come in different styles. Knotted, frogged, strapped, buckled, etc. These transition between belt and scabbard. None of the assemblages illustrated above are period so don't spent a lot of effort defining the details. They are lovely modern interpretations. Ewart Oakeshott did a chapter of one of his books on scabbards and suspension so its probably easiest to use his terminology. Most people interested in the topic are familiar with his works and can relate immediately to his terminology. Between the related websites "Effigies and Brasses" and "Miniatures and Illuminations", a researcher should be able to find sufficient period usage illustrated. Definitions are a modern hangup. Agree with you on the first 2 Kel but the last Albion one? That not based on a variety of effigies, statues, ms illustrations etc? Yeah, the last one is well done. For some reason my tablet didn't load that one this morning. Service has been kinda wonky while I'm traveling. Gotta update the software or something. I have a feeling that if you ever managed to find a document that discussed the making of them, it would say something highly unuseful like "and make the belt in the usual way". That killer phrase pops up in all manner of written descriptions from cooking to wheelmaking. Scabbards did come in a variety of layouts and they came with variations and makers would have local words or indeed their own words and then there are language differences also. As a modern example. In an old job I used to use a toughed acrylic adhesive made by 3M. It could be called 3M410 (or whatever it was), it could be called acrylic adhesive, semi structural adhesive, toughened acrylic; all would work and all are right. It was however called 'Death glue' because it stank so bad it had to kill you. All special effects and model makers in London call toughened acrylic adhesive, 'death glue'. I bet its not called that in Paris, Solignen, Toledo or NY. I suspect there were multiple words used for all the parts and none standard across the board. Ewart Oakeshott did a chapter of one of his books on scabbards and suspension so its probably easiest to use his terminology. I have many of his books on my shelves. Do you remember which book specifically? Sorry Harry, my library is in Toronto & I'm not this week. Wild guess would be The Sword in the Age of Chivalry. If no one pops up the answer, I'm back home next Tuesday. The Sword in the Age of Chivalry. Ah! The one Oakeshott book that I don't have! Those fittings used in a frog or baldric with a stud or hook to secure in the carrier.